Tom developed in interest in geology following his dad to the remote corners of Utah on childhood rockhounding trips. 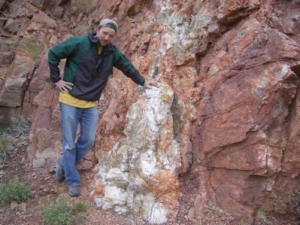 He completed his undergraduate degree in geology (with mineralogy/petrology emphasis) at the University of Utah, and a Master's degree in economic geology at Washington State University. His thesis work focused on metasotism and stable isotope fractionation in sandstones peripheral to a buried porphyry Mo deposit in SW Colorado. He's currently working on a PhD under the supervision of Dr. Thomas Monecke at the Colorado School of Mines. Tom has been employed at RockWare for 10 years, primarily as consultant specializing in aqueous geochemical modeling projects. Tom has taught or co-taught over 20 geochemical modeling short courses to clients in industry, research and academia. This study will use a combination of textural evidence and geochemical modeling to define the nature and origin of carbonate alteration at the Eskay Creek Massive Sulfide deposit, located in the Iskut River area of Northwestern BC. Preliminary mineralogical and geochemical investigations show that the carbonaceous mudstone hosting the stratiform sulfide mineralization has been affected by widespread carbonate alteration, with abundant ankerite proximal to mineralization, and calcite in distal zones. Kaolinite formation accompanies the carbonate alteration. Emphasis will be paid to the evaluation of three possible mechanisms for carbonate alteration in the host mudstones: 1) alteration by cooling hydrothermal fluids, 2) alteration by hydrothermal fluids that have lost significant amounts of CO2 due to boiling, and 3) alteration by seawater that has been heated by CO2 derived from a boiling hydrothermal fluid. Based on the modeling outcome, a set of guidelines will be formulated that will permit interpretation of carbonate alteration halos recognizable in the field by simple and readily applicable exploration techniques.